At Culver's, employee happiness and operational efficiency go hand-in-hand. 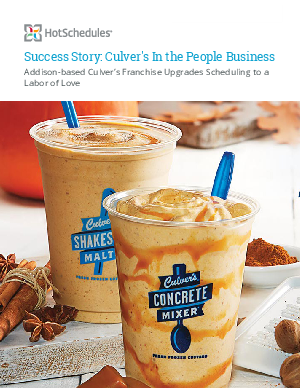 After moving to HotSchedules Labor, Logbook and WebClock, the Culver's of Addison, IL location was able to save managers' time, energy, and labor costs by optimizing their processes. With better system in place, they reduced the overall burden on leadership and increased employee attendance. Their new scheduling process has also improved work-life balance for their employees. Download now to find out how HotSchedules helped them achieve success!